Thank you for taking a closer look at Easy Street Vacation Rentals, Property Management Services. Easy Street Vacation Rentals is a small, hands-on rental management company - by choice. 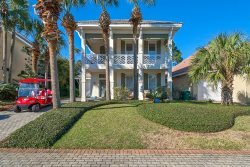 My wife and I personally own 4 single family vacation rental homes in the Crystal Beach area of Destin, Florida, and manage 14 others for out of state owners. My wife and I are both retired executives, I was a Credit Union CEO for twenty plus years. This is our dream retirement job and we thoroughly enjoy what we do. Our goal is to grow our little company to where we can still hands-on manage the operation, so we can maintain the quality of service we provide to our Owners and Guests. We are selective on the properties we take over, and all properties that we currently manage for others are high-quality, pet friendly homes, and all have come from friends or referrals of current owners. We have developed a unique market niche, we cater to high end pet friendly visitors. We have very tight controls (See Guest Terms and Conditions) and have rarely had "pet" issues, and more importantly, our properties have NEVER suffered negative consequences from being pet friendly. What this market niche has done, however, is significantly increased our gross revenue through pet fees (which are less than half the cost of boarding pets), and repeat and referred renters. Our occupancy rate consistently exceeds 75%, and our repeat renter ratios exceeds 65%. At Easy Street Vacation Rentals we are committed to service and performance, both to our Owners and to our Guests, and take personal responsibility for the successful rental of your property. Perform inventory of dishes, silverware, pots & pans, kitchen appliances, linen, etc. Schedule initial deep cleaning, which will help us determine an appropriate cleaning fee to be charged to the guest after each rental stay. Provide Contact Information to Neighbors if Requested. Facilitation of Guest Check-in and Guest Check-out Procedures. Enforcement of all Rental Rules and Regulations. Resolution of any Tenant Issues. Ensure that Property is Maintained to High Standards. Prepare for and Evaluate home following storms. Provide Owners Access to our Vendor List & Maintenance Providers. Coordinate home maintenance & updates on Owners behalf. Provide 24/7 Service & Support for Tenants and Property Owners. Conduct Inspections and Inventory upon Guest Check-out. Inspect to ensure thorough cleaning in preparation of new guest arrivals. Provide Detailed Bookkeeping & Accounting of all Reservations. Provide Owners Access to Secure Reservation System and Availability Calendar. Mail Checks, Direct Deposit or Wire Transfer all Net proceeds to Owners Account. Other services as needed and requested. Monthly Management Fee: 25% of Rental Revenue. Manage and Track all rental guest's information. Collect rental income and pay authorized taxes and expenses. Provide Homeowner Website Login information for access to website homeowner features, which include homeowners monthly statements, property availability calendar, Ability to book Homeowner use dates, and other valuable Homeowner information. Monthly issue Owner checks (or direct deposit) for revenues collected for the respective month, minus our fees and any maintenance charges that have been authorized. Collect and Pay sales and lodging taxes associated with the rental of the property. We offer a website exclusively for all of our properties, where guests can view all properties, and book online. Guest can also email reservation requests or contact us for additional information. We are available to answer questions and assist guests in the reservations process from 7 am - 6 pm. We also do e-mail marketing blasts at least quarterly and advertise on HomeAway and VRBO. Respond to all guest inquiries and requests, within 24 hours. Accept reservations, generate rental agreement and update availability calendar. Collect rents, deposits and fees associated with property rental. Do walk through inspection of the property after check-out. We provide a Repair Request Form in each home for guests to list any home issues. Review completed Repair Requests following all guests visit. Outside - check yard for pet issues, cleaning of the BBQ, condition of patio furniture, and other exterior maintenance issues. Inside - check for pet issues, potential guest damage, serviceability of all appliances & furniture, and inspect for any missing items, and other interior maintenance issues. Monthly check A/C filters and Condensation Lines, batteries for all remotes, and overall home wear and tear. Quarterly we do a more through inspection, including kitchen appliances, plumbing fixtures, etc. Probably the most important convenience we provide is local property management, we live locally and drive by all properties at least once a day during off season and up to three times a day during high season, noting any suspicious activity. We are available daily for you and our guests. We want you to consider us as your trusted local agent, a responsibility we do not take lightly. When you deal with Easy Street vacation Rentals, you deal with the actual owners of the business. We clearly understand, we don't make money unless you make money, and to do that we must create a great guest experience at your home. We would be happy to have you contact any of our existing Owners for a first hand recommendation on our work ethic, reliability, services and performance. In the seven years we have been in business we have NEVER lost a home to poor performance. Please Feel free to Contact Us if you have any additional questions or to receive a Sample Property Management Agreement. And remember, we would be working for you, if you don't succeed, we don't succeed.